Japan's housing starts declined at a faster-than-expected rate in June, after rising in the previous two months, data also showed that Japan's consumer confidence weakened unexpectedly in July. It looks like now the market is almost not interested in the Yen as a safe asset, and is calmly assessing external risk levels. According to different estimates, there is a risk now for Japan to get involved in the trade wars between the US and China. As of yet, there are no compelling reasons to be afraid of it, but in theory, such possibility really exists. The BoJ today issued a statement saying it retained its massive monetary stimulus and announced its plan to bring flexibility in bond operations. The central bank intends to maintain the current extremely low levels of short and long-term interest rates for an extended period of time. 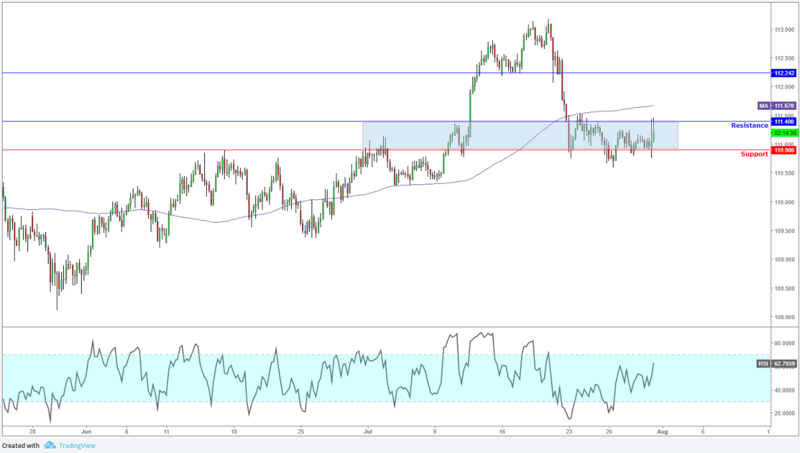 Based on the yesterday's trading range, the direction of the USD/JPY today is likely to be determined by trader reaction to the 110.80 support level. Basically, we’re looking for a downside bias to develop on a sustained move under 110.80 and for an upside bias to develop on a sustained move over the 111.40 resistance. Watch out for a high volume, high volatility trading session.